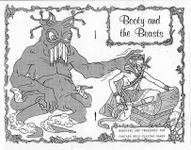 An unlicensed Dungeons & Dragons supplement created by two artists who later went on to work for TSR: Erol Otus and Paul Reiche III (along with Mathias Genser). The book was about the same size as the white box Original D&D booklets. Contained in this volume are new monsters, including demons, robots, and parasites, and new magical and technological treasures. Many of these monsters and treasures are of a more powerful nature than will be found in most fantasy role-playing campaigns. This is intentional, for we feel that this will provide a greater challenge and incentive to those more experienced players who, since fantasy role-playing has been around now for a number of years, must be aquiring higher and higher level characters. We also include less powerful monsters such as Fungus Men, Termite People, Goons, etc., and lower power items such as the Doorknob of Unrestrained Entry, Vibroblade, Breathing Device, etc. In addition, we provide several charts and lists in the back of this book to aid in the playing of these monsters and treasures. Finally, these monsters and treasures are not intended to stand by themselves but rather to add to the hundreds of monsters and treasures already available.